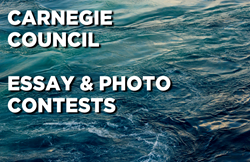 Carnegie Council for Ethics in International Affairs announces its two annual international contests: an essay contest for teachers and students on the world's greatest ethical challenge, and a photo contest for students on climate change. In your opinion, what is the greatest ethical challenge facing the world today? Whether contestants choose to express themselves in words or in photos, Carnegie Council is looking for thoughtfulness and originality. The deadline for both contests is December 31, 2016. ESSAY TOPIC: "In your opinion, what is the greatest ethical challenge facing the world today?" All teachers, at whatever level, are eligible. All students, from high school students through graduate students, are eligible. Collaborative essays between students and teachers are welcome. Word limit:1,000-1,500 words. To learn more, go to https://www.carnegiecouncil.org/news/announcements/2017-08-07-international-student-teacher-essay-contest-2017-the-worlds-greatest-ethical-challenge. This year's topic is climate change: Please submit photos that show examples of climate change OR examples of combating or adapting to climate change. All students of every nationality are eligible. Non-students will be disqualified. The minimum age is 13. To learn more, go to https://www.carnegiecouncil.org/news/announcements/2017-08-09-international-student-photo-contest-2017-climate-change.